Introduction The US Army set up the Savanna Proving Grounds during WWI, with construction starting in 1917. It was originally a remote site for the Rock Island Arsenal to test cannons. A multitude of unexploded shells remain in the area as a result. The Savanna name is easy to confuse with the Department of Energy Savannah River Site in South Carolina. That confusion worked in the favor of the Army as the Savanna site became the home for US Army nuclear weapons projects. Over time, the Savanna installation became a super-secret development and testing lab where the US Army went when it wanted to be alone, much like the Air Force’s Area 51. The Savanna site is 14 miles long by 3 miles wide. It adjoins the Mississippi River, and has a major rail line running through the property. The location is out in the middle of nowhere on back country roads. While water access was key in the location of the Savanna site, there appear to be little in the form of dock facilities. One formerly secret dock is located in the maze of islands on the north end of the installation. That was likely used for commando training with backpack-sized nuclear weapons. There are rumors that entire barges can enter man-made caverns on the side of the river bluffs where they can be unloaded inside and away from the eyes of Soviet satellites. While that might be unlikely, it is very possible that underground conveyor belts were used to move materials from the docks to various construction sites. As it stands now, there appear to be no roads that run from the river front to the industrial buildings, which means that the materials had to be moved underground. This is the former entrance sign for the Savanna site when it was known as the Savanna Army Depot prior to being placed on the BRAC list in 1995 and being shutdown in 2000. This sign is located on Illinois Route 84 about 8 miles north of Savanna, Illinois. The site is currently in the hands of a private company that was set up by the base closing commission. They have tried a number of ideas to reuse this facility, but almost nothing has come of it yet. This sign once read Eagles Landing Retirement Community when they hoped the old base housing could be converted into condos for retired people. I guess retired people don’t like living at atomic bomb dumps anymore than the rest of us. This is a telephone junction box located outside of the installation. This is some pretty serious telephone capacity for being a rural area, another clue that something out of the ordinary was going on nearby. This is just the non-hardened phone lines. Reports are that buried hardened lines come into Savanna from a number of DOD locations. In fact, it was recently revealed that a huge underground data center is located on the Savanna site that once was a major hub for military communications. A company recently proposed reusing this underground data center for large companies to host bomb-proof computer systems. Unfortunately, this idea went belly up with the dot-com crash. Note—as of 2007, the data bunker concept is back, and is now up and running at Savanna. A network operations center has been set up, and you can now house your servers in a bunker that once was a home to an atomic bomb. This is an off-base housing area. The base road once ran next to that small building. That building served as a guard house for the community. A few diehards still live in the settlement. A photo of the old base road, which runs next to a below the current base entrance road. Note the utility access cover that goes into an underground conduit. This underground conduit houses hardened communications lines, plus sewer and water for the locals. The ground water is so polluted in this area that public sewer and water is provided for the local area residents. Here are examples of base housing. These are apartment style buildings, likely used by officers given the location near the HQ building complex. The Savanna site is reported to have had 800 people between the military and workers in the munitions factories. While I was not able to tour the entire facility (I had to keep ducking security guards), I did not see housing for these kinds of numbers. There is also a report that as many as 800 more workers were off the record and working on black projects. This shot is an overview of one of the factory complexes. Look carefully through the trees, and you will realize the magnitude of the size of these buildings. The complex is well over 1/2 mile long. Since it was off-limits, I was not able to get any closer. This is the main entry point to the Savanna site. It is no longer guarded, and it is open to the general public. There are two public sites within the now closed facility, including a wildlife viewing platform. A truck is visible in the background. When I visited, there was a steady stream of truck traffic in and out of the site. Most of the trucks were unmarked white cargo vans or semi-tractors. They did not have either owners name or ICC markings. Since the contaminated soil is being burned on-site, one can only wonder what is being hauled out in these trucks. One report is that they are hauling equipment to the McAllister Army Ammunition Planet in Oklahoma. I find it hard to believe that equipment that has been sitting for 10 years is still of use. It is far more likely that they are hauling out soil and materials that are contaminated with nuclear waste, and taking them to a site in Nevada for storage. Ironically, the McAllister plant is located in the city of Savanna, Oklahoma, further complicating the name game. This is one of the newer buildings on the site, and it appears that it has been refurbished. Given the number of pick-up trucks in the parking lot and going in and out of the parking lot, I suspect that this building houses the engineering office for the firm that is doing the clean-up work. These big expensive pickups would likely be assigned to supervisors and site engineers. Note the reflection in the mirror at the bottom of the photo. The reflection gives a view of one of the warehouse complexes. We will see in more detail later on. This is an example of one of the older warehouse complexes. There are several rows of these metal buildings, and several buildings in a row. There are perhaps 25 such buildings in this cluster, with each one being perhaps 100 feet wide by 300 feet long. These buildings do not have dock facilities and few doors or windows. The buildings also do not look heated given very little power going in, and the one chimney looks like it only heats a small office area. The stuff stored here was not climate controlled, rather, all the buildings did is keep them dry. That is likely used for storing artillery pieces and parts of such guns awaiting assembly. It might also be for empty bomb and shell casings. This is the mainline of the railroad. It cuts through part of the base, dividing it into two secured units. That allowed the railroad to operate through the base without allowing railroad personal to have access to the base. This is a very modern warehouse complex. Given there are only a few buildings, and the closest building has a large chiller for a refrigerator/freezer, I suspect that this was the central stores area for base food and supplies. There are over 100 miles of US Army rail road track within the Savanna site. Some of these sidings and spurs are being used to store box cars. These particular box cars have US Army markings on them. They were likely used to haul large guns, gun parts, and specialty bombs out of the Savanna complex, and bring raw materials in. Here is another complex of the older metal warehouses. One building is falling apart. It appears that someone started to dismantle the building, perhaps far enough to allow heavy equipment into the building. A large pile of contaminated soil in the foreground likely came from that building. Two of the biggest contaminants are asbestos and TNT. It is likely that these buildings are saturated with these hazardous materials. A view of the water tower. It appears to have been recently painted. I am surprised that this much water storage is needed given that the river is next to the site and wells are easy to dig in this area. This gives an indication as to how bad the ground water pollution must be since this water tower obviously serves a fairly large area of population. This is one of the factory areas. Notice that the buildings are all connected with covered passages. Also notice the large hump just before the taller building. That is an entrance to an underground bunker for storing live ammunition. Here is another factory complex. Again, notice the covered passage ways radiating out from the central buildings. Since this is a newer and more up to date building, it was likely used for R&D and production of depleted uranium rounds for the A-10 tank killer. Here is a group of warehouses with railroad access. There are several rows of buildings, and each row is upwards of a mile long. Rail tracks run on each side of the buildings. There must be over a thousand dock doors. Whatever the Army was storing here, they were storing a lot of it. The scale of this is hard to comprehend...the buildings go on and on, and there are several such clusters of buildings. Another group of rail cars in storage. These cars have civilian markings. There was a business planning to move into the site that repairs rail cars. One has to wonder if these cars were spotted here for future repair, or if they will be used to haul stuff out of the plant. While it is hard to see in this photo, this area is littered with underground bunkers. There is one sticking up next to the bigger of the two utility poles. The back of a bunker is sticking up just to the right of this bunker. Another bunker mound is visible on the very far left hand side of the photo. Two older brick buildings. The closer building looks like power plant, but with the smoke stack removed. The more distant building could be a warehouse. Then again, notice that there are big lightning rods located around the building. It is possible that these are research labs, especially given their isolation from other buildings and complexes. There were a number of these odd buildings on the site. It looks like loads of materials were brought in under the dock area, then lifted up to the dock to be fed into the manufacturing equipment. Given the size of the structure, it might have been used for moving large steel items, such as cannons or bomb casings. More storage units. It looks like these use a modular plan, and the 2nd building is two units of the first closer building. Given that these are concrete buildings, it is very possible that they were used as holding areas for nuclear weapons or depleted uranium shells. Another view of the newer factory shown a few photos above. This is a warehouse building with rail access. The building itself is nearly 1000 feet long, and it connects to the main factory complex by a series of covered walkways. Notice the pickup truck parked in front of this building. People are actively working on the cleanup in this area. Some of the buildings are contaminated with such dangerous stuff, like WWII era chemical weapons, that robots are being used to do the hands-on work. An assembly building in this factory complex. Note the covered walkways leading to and away from this building. It is possible that this complex was used for making chemical or nuclear mortar shells. The main factory would mix the chemicals, this building would fill the shells, and the big warehouse would store them until they were moved to more safer locations. The walkways help separate the buildings in the event of an accident, as well as hiding the process from satellites. This is the back side of the main building in this factory complex. There are a number of such factory complexes on the site. I was being dogged by security guards as I drove around, which means that I sometimes had to take the shot in front of me through the fences rather than looking for better vantage points, or climbing up on top of my car. While the large building is clearly visible, there are many smaller buildings scattered behind the trees. This appears to be a maintenance building and machine shop. It is actively in use supporting the cleanup. Despite having passed through the main gate, we still have fences to contend with. Each area within the Savanna site is secured with a separate ring of chain link fence, creating a very compartmentalized environment. This building is interesting in that it appears to have bits and pieces from several different generations. Also notice the warning siren on the roof. That could be for weather warnings, but is also likely used for warning of chemical and nuclear accidents. Based on the layout of the building, I would guess that this was a fire station. The larger building would be the garage for the fire trucks, while the newer single story building would be the bunk house and living quarters for the fire crews. Another older metal building, this time, with doors that allow trains to pass through the building. While this could be some kind of industrial storage, it is just as likely that this is the building where they housed and did light maintenance on the rail locomotives that were assigned to the base. Another photo of the underground bunkers. This particular area had over 100 of these bunkers visible. The satellite photo shows that there may have been over a 1000 in another part of the facility. The Savanna site was the largest Army depot during its peak operational years during WWII and the cold war. Recent News The Savanna site was all but finished as a depot following Vietnam as depot facilities were moved towards the coasts. The heavy manufacturing was ended by the end of WWII. Chemical weapons went out of style in the 60’s, and the Army backed off of using nuclear weapons after the cold war. That left the depleted uranium shell program as the last major tenant besides the US Army Information Command, which hosted a major data center and communications node. All kinds of proposals have come and gone. Trucking companies would like to use the warehouses, but Savanna is no where near any place important. Various things such as a retirement home, rail car repair facility, dot com server farm, telemarketing center, and fish farm has been proposed. 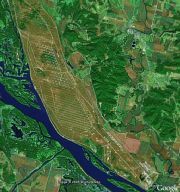 Barring that, much of the land has been turned over to the US Fish And Wildlife, who has renamed the place the Lost Mound NWA. As part of being a wildlife area, the facility is again mostly off-limits to all but certain wildlife researchers. The most recent proposal has come from the Sac and Fox Nation of Oklahoma. They used to live in this area prior to losing the Black Hawk war and being forced into exile. They have been attempting to buy the Savanna site and turn it into a reservation for tribe members who want to move back to Illinois. As part of their proposal, they want to build a casino and bingo hall, a call center, a fuel blending facility, a biodiesel plant, and an ethanol plant. The latest report from the Savanna site Local Redevelopment Authority says that it might take until 2014 to clean up the site to the point where it is safe for the general public.